Cesky Krumlov Art agency is the only existing Art Agency in the Czech Republic which is committed to a permanent presentation of ceramic artworks by Czech and Moravan professional artist. These unique artworks are presented on joint exhibitions, eminent exhibitions of elite artists work and solo exhibitions. The Art Agency organizes an annual international ceramic artworks show in Cesky Krumlov, in collaboration with the Chateau Cesky Krumlov, Cesky Krumlov State Castle and the Ministry of Culture of the Czech Republic. It also organizes exhibitions abroad on an alternate basis. Czech Culture Gallery, which is presenting several Czech artists to the public in rotating 2-month exhibitions, performs here too. Cesky Krumlov Art Agency operates the International Ceramic Studio - an international symposium and providing residence to individual artists who wants to stay for a creative holidays. The Agency owns expanding collection of museum-quality contemporary art. Long-term exhibition features collection of Czech Ceramic Design Agency and the artworks created at international symposia of large size organized by Czech Ceramic Design Agency in the International Art Studio in Cesky Krumlov. This gallery is located in the Wenceslas cellars on the IVth court of the Cesky Krumlov State Castle and Chateau. The international shows of ceramic art are a selective and prestigious events. Participation is for all artists of several nationalities. All displayed items are for sale. Gallery is located in Maselnice on the IInd court of the Cesky Krumlov State Castle and Chateau. Regularly houses an international shows of top prestige. Authors are selected on basis of art documentation submitted and also on artist�s resume. 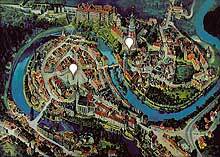 This exhibition agenda is co-operating with Cesky Krumlov State Castle and Chateau. Czech artists are presented to the public in solo exhibitions spread from painting through sculpture, glass, graphic art and tapestry. All displayed items are for sale. Cesky Krumlov Art studio is an international studio, which houses several international workshop and providing residence to individual artists who wants to stay for a creative holidays. International workshop are renowned events and are held either in the drawing cathegory na large-scale drawing or exterior ceramic sculpture. Workshops are open to all incoming artists of several nationalities. Authors are selected on basis of art documentation submitted and also on artist�s resume. Find more about Art Agency in the Czech Republic.